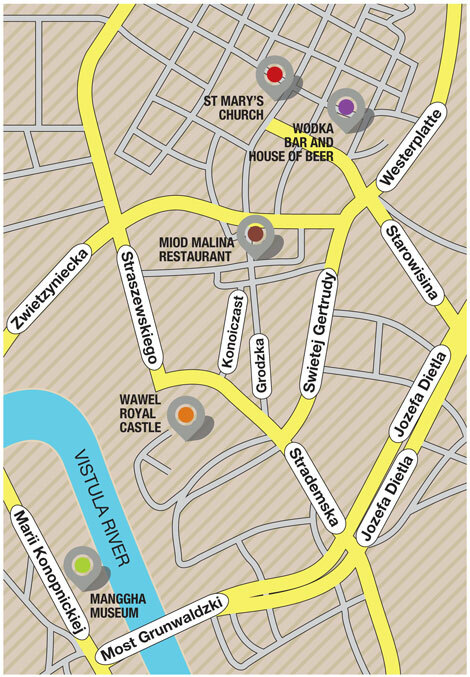 Jenny Southan takes a wander and discovers the Polish city is rich in Japanese art, flavoured vodka and hearty cuisine. Start your walking tour on the banks of the Vistula river, near the site where the new ICE convention centre is being constructed (due to open in 2015). The Manggha Museum of Japanese Art and Technology was built in 1994 thanks, in part, to a US$340,000 donation from Oscar-winning Polish film director Andrzej Wajda, and houses a vast collection of Japanese artworks owned by Krakow’s National Museum. Beneath the undulating roof, visitors will find a stunning exhibit of traditional woodblock prints dating back to the late 1800s created by masters such as Hiroshige and Kunisada. These meticulous scenes of life and landscape reveal detailed renderings of all things Japanese – from cherry trees and shrines to performing geishas and samurai warriors. Cross Most Grunwaldzki bridge and walk along the other side of the river until you get to the bronze statue of a dragon. The fire-breathing beast marks the entrance to a cave that goes deep into Wawel Hill, on which Wawel Castle resides. The dragon’s “lair”, which is 270 metres long (only 80 metres can be accessed), is open to visitors via Thieves Tower. If you are pushed for time, ascend the steps and go straight to the 14th-century castle. Much of it has been preserved for posterity, and permanent exhibits include the State Rooms, Royal Private Apartments, and Crown Treasury and Armoury. (Entry times and prices vary depending on time of year.) Around the corner, it’s worth checking out the Cathedral of St Stanislaus and St Wenceslaus – it’s the place where Pope John Paul II gave his first mass in 1946. Continue up the road to the main square. St Mary’s church – with its redbrick Gothic exterior and twin towers – is in the far right-hand corner. The 14th-century place of worship may not look ornate from the outside, but the interior is dazzling. Peer up and you’ll see a cobalt blue sky with gold stars painted on the ceiling and, lower down, rich tapestry-like stained-glass windows. Take a look at what is said to be Europe’s biggest medieval altar, measuring 143 sqm and costing more than 2,000 gulden, a small fortune in 1489 when it was completed by Bavarian sculptor Veit Stoss. It has more than 200 painted and gilded figures carved from lime wood. During the Second World War the altarpiece was taken to Germany by the Nazis and wasn’t recovered until 1946, when it was found in the basement of Nuremberg Castle. Entry is 6zl (£1.30). Open Mon-Sat 11.30am-6pm, Sun 2pm-6pm. Said your prayers? Good. Now go for a drink. A short walk around the corner will bring you either to the House of Beer (Ul Sw Tomasza 35), which is good if you are here in summer and need to cool down, or Wodka bar and café (Ul Mikolajska 5), which offers shots of fiery spirits to warm your cockles in winter. The former is open from 2pm until the early hours and has about 150 different types of piwo by the bottle or on tap. Try Tyskie, Zywiec or Czerwony Smok. If you like the sound of Wodka, it has a couple of seats outside in good weather, as well as a few inside. But its choice of about 120 vodkas – including Grey Goose, Wyborowa and flavoured varieties such as pepper, hazelnut, pear, blackcurrant, cranberry, mango and lime – makes up for the fact it’s so small. Go for the four-shot taster menu for 16zl (£3.30). Open from 3pm (from 1pm Saturday) until early morning.